The crew operated flight LC843 from Rotterdam The Hague Airport, Netherlands to Aberdeen International Airport, Scotland, U.K.. It was an outbound flight which was scheduled to depart with 15 passengers, two flight crew and one cabin crew. The flight crew landed the aircraft earlier that day in Rotterdam with the inbound flight from Aberdeen. They noticed no abnormalities during the flight or ground operations. After completing the turnaround checks, including the external check, they started the return flight to Aberdeen. The captain was seated in the left hand seat and was the pilot flying. Flight LC843 took off from runway 06 at Rotterdam Airport at 15:44 hours local time. A hydraulic caption light on the Central Warning Panel and an aural warning were activated during the climb out at approximately 400 feet AGL. The actual configuration of the aircraft was gear up and locked and flaps still at take-off position, flaps 15. After cancelation of the aural warning the flight crew checked the hydraulic pressure gauges. They noticed that the emergency pressure was normal, but the main pressure was low. The flight crew continued the climb and selected flaps up. They noticed on the flap indicator that the flaps were not moving up and reset the flap lever to flaps 15. After levelling off, the first officer checked the hydraulic gauges and saw the hydraulic fluid quantity decreasing. The flight crew assessed the situation. Then, about two minutes after selection of flaps up, the first officer switched off the hydraulic pump. While the flight crew continued the departure, the first officer started the HYDR Light On abnormal checklist. Shortly thereafter, the flight crew switched controls making the first officer pilot flying. After coordination with air traffic control, they proceeded towards the Rotterdam holding (ROT holding) for trouble shooting. The captain continued with the HYDR Light On abnormal checklist followed by the HYDRAULIC FLUID LOSS abnormal checklist. The flight crew decided to return to Rotterdam, because the remaining fuel was not sufficient for a flight to Aberdeen with the flaps not in the up position. The abnormal checklist actions included the emergency landing gear extension followed by operating the hand pump lever to increase pressure in the brake accumulators. In the holding the flight crew switched controls again, so that the first officer could operate the hand pump. The hand pump was operated in the holding and during the approach for a total of about six minutes. On final, the captain informed air traffic control that they might have problems vacating the runway due to absence of nose wheel steering. The landing at runway 06 was uneventful. The captain used engine reverse and wheel brakes to come to a complete stop just short of intersection V4. He asked the first officer to operate the hand pump again to increase brake pressure in order to taxi and to clear the runway. After two minutes of pumping, the flight crew noticed no increase of brake accumulator pressure on the gauge. The captain maintained pressure on the brakes with his feet because he was unable to set the parking brake. The flight crew decided to shut down the engines on the runway and informed air traffic control. The flight crew executed the shutdown items on the normal checklist. Halfway the checklist (just prior to the checklist item "condition lever start") the captain informed the passengers that the engines would be shut down on the runway. Then, the condition lever was moved to the start position whereupon the aircraft started to roll uncontrollable to the shoulder of the runway. The aircraft came to a full stop partly in the grass. After completion of the normal shutdown checklist, the captain ordered an emergency evacuation. Only the forward doors were opened and used by the passengers and the crew to vacate the aircraft. All passengers and crew evacuated the aircraft without any reported injuries. The serious incident on 30 September 2015 with the Saab 340B at Rotterdam The Hague Airport was initiated by a broken aluminum down lock swivel of the right hand main landing gear due to fatigue. This problem was recognized by Saab Aircraft and they issued a non-compulsory Service Bulletin 340-32-142 to replace the aluminum swivels. 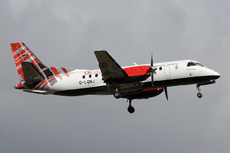 The Saab 340B hydraulic system provides sufficient redundancy to continue safe operation when an aluminum swivel fails. The non-compulsory Service Bulletin 340-32-142 issued by Saab Aircraft to replace the aluminum swivels instead of an Airworthiness Directive is therefore acceptable. The flight crew delayed the appropriate memory item, hydraulic pump switch off, during the hydraulic failure. No particular reason was found. The layout of the hydraulic malfunction checklists, and the missing engine shutdown procedure made the flight crew to shut down the engine by the normal procedure. This resulted in an uncontrolled forward motion of the aircraft which ended in the grass next to the runway, with neither braking nor nose wheel steering capabilities. When the central hydraulic system fails, one has to rely on the hydraulic backup systems. The HYDRAULIC FLUID LOSS Expanded Abnormal Checklist gives the impression that operation of the hand pump lever hydraulic system is unlimited, while in practice this is limited to approximately 150 lever strokes. The outcome of this incident however was influenced by the decision of the flight crew to increase the pressure of the brake accumulators by using the hand pump, although the brake accumulators were already on working pressure capable of at least one full landing. The activation of the hand pump, with the brake accumulators on normal hydraulic pressure, may create an overpressure resulting in the activation of the relief valve spilling the limited available hydraulic fluid overboard. The loss of brake pressure on the runway may have been avoided if the flight crew was more aware of the limitations of the hand pump hydraulic system. After the aircraft stopped in the grass next to the runway, there were no imminent threats for aircraft occupants and the aircraft integrity was evident. Therefore a normal disembarkation was possible.